Oster 12 Speed Osterizer Blender. Compact cube design for counter appeal. 5-cup scratch resistant and dishwasher safe glass jar. All-Metal Drive system for power and extra durability. Available in 8, 10, 12, 14 and 16 speeds. Price $40 Based on the manufacturer's suggested retail price (MSRP), this blender is LESS EXPENSIVE THAN AVERAGE and is priced in the BOTTOM 14% of all blenders. Watts The BL10450H is LESS POWERFUL THAN AVERAGE and ranks in the BOTTOM 9% of all blenders. 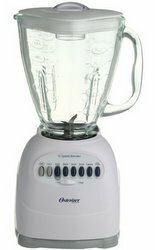 Stars Based on actual user experience and reviews, this blender is RATED ABOUT AVERAGE by 54 USERS when compared to all other blenders. 55% of users rate this blender favorably. My husband and I use a blender almost every day for protein shakes. The Oster has always been very dependable and works beautifully. Doesn't crush ice too well. Leaves small chunks. Stuff on the top doesn't make it down to the blade. The glass jar doesn't lock or snugly "fit" in the casing when you use the blender - it just sort of sits there flimsily. I make a smoothie just about every morning with bananas, a few frozen strawberries and yogurt. It can not handle that. This blender works well, however you do sometimes have to stick something in there to get the top of your concoction well-mixed in with the rest of it.